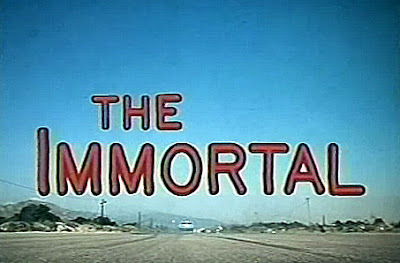 The TV journey of The Immortal (1969-1971) begins with an ABC Movie of the Week that aired on September 30, 1969. Intriguingly, the source material goes back to award-winning author James Gunn, and his Bantam book of 1964: The Immortals. Gunn’s work is a dystopian nightmare (in the mode, for example, of Blade Runner , about a random mutation or “genetic gift” of immortality that begins cropping up in people of a crowded, future society. In that future society, quality healthcare is only for the rich and privileged, and the cities are not just dystopic but sort of cancer farms, where the environment is ravaged and downright dangerous. An ethical doctor named Pearce discovers the mutation that grants some people immortal life, including a vagrant named Michael Cartwright. But powerful forces in this future world want to control Cartwright's blood, so as to preserve their own lives…forever. 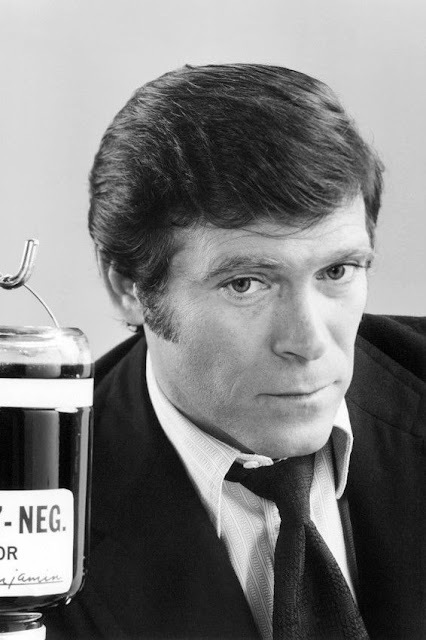 The TV-movie of 1969, and the TV series that followed dispensed with the futuristic dystopia (and therefore much of the social commentary about a world controlled by the “haves” and “have mores,”) instead focusing on a single individual, Ben Richards (Christopher George), and his escape from a wealthy businessman (first Braddock, and then, in the TV series, Maitland), who literally wants to bleed him dry. So instead of a story clearly about how society favors the rich and exploits the poor, the TV series is a “man on the run” story in the mold of The Fugitive (1963-1967) or The Incredible Hulk (1978-1982). The novel’s Dr. Pearce is a main character in the movie of the week, played by Ralph Bellamy, and the name Cartwright is given to Richards’ girlfriend, Sylvia (Carol Lynley). 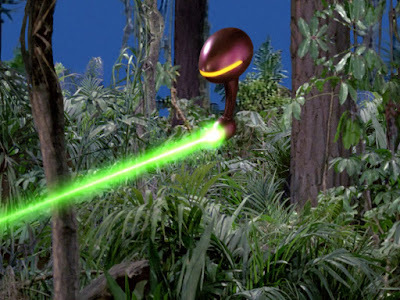 The pilot or ‘TV movie’ start of the series is not faithful to Gunn’s work in terms of its setting, however, or the vast majority of its characters. Once a viewer accepts that fact, though, there is nothing to prevent one from enjoying the show as a riveting, and well-directed meditation on privacy, freedom, and to some extent, bioethics. A bitter old man and billionaire, Jordan Braddock (Barry Sullivan) nearly dies when his private jet crashes in the desert. 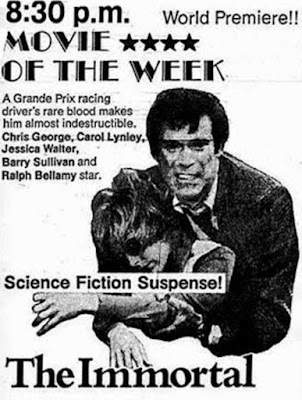 His doctor, Pearce (Ralph Bellamy) gives him a transfusion from test car driver, Ben Richards (Christopher George), and the blood unexpectedly rejuvenates him. Braddock not only recovers from his injuries, he seems to grow younger. Unfortunately, the restorative qualities of Richards' blood wear off after a time, and Braddock requires additional transfusions. Addicted to the energy he feels as he becomes younger, Braddock offers to set up a medical foundation for Pearce, and pay Richards to be his personal blood donor. 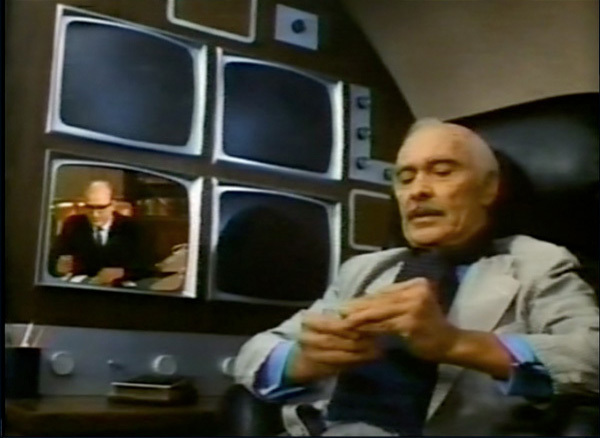 Dr. Pearce soon grows concerned, and tells Richards to flee while he can. He notes that Braddock has a “billionaire’s income and the mind of a thief.” Braddock’s need to control his new resource -- Richards -- leads him to capture the driver, lock him away in his personal bomb shelter, and then stage his death so no one will come looking for him. Now Richards is a prisoner, unable to leave the confines of his room. Miraculously, Richards manages to escape, and sees his girlfriend, Sylvia (Carol Lynley), but Braddock is relentless in his pursuit of Richards. 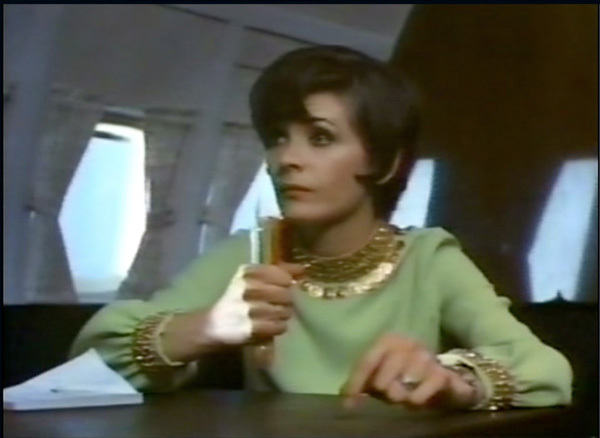 One of his henchmen attempts to kill Sylvia, and Richards makes certain she gets a transfusion of his miraculous blood so she will live. Afterwards, he realizes he’s got to “run far” and “run fast” to escape his previous life, lest he be Braddock’s prisoner forever. Worse, Richards has a long lost brother out there somewhere, a brother who may possess the same unusual blood that makes Ben Richards so valuable a commodity for the rich and powerful. It is amazing how timely and relevant The Immortal feels in 2017-2018. On a very basic level, this TV-movie is about the way that the super-rich wish to control not only the body politic of our country, but our citizen’s very bodies as well. Ben Richards possesses amazing blood, but it is his blood, after all, and his choice to do with it as he will. The super-rich, like Braddock, cannot stomach the idea of resources they can’t control, or the right of someone to disagree with their sense of morality or "ownership." One of the most fascinating aspects of this TV-movie is, accordingly, the portrayal of Braddock by Sullivan. He exerts total control over his people by surveillance, even spying on his plane's pilots. He has a trophy wife, played by Jessica Walter, whom he clearly controls and owns. And Braddock can even make doctors such as Pearce bend to his will by offering money to further not only their careers, but their medical aims. Even the very premise of the series that follows is about the super-rich and their out-sized power in modern America. Richards realizes he “can’t trust anyone,” because Braddock’s money can touch and impact everyone in the country. Everyone has a price. Suddenly, Richards’ choice to control his own body runs smack into “corporate” interests. Braddock wants Richards' blood for himself, but also for his rich buddies. And he could make a killing selling Richards’ blood to them. Owning Richards is just "good business," and he will not let anyone stop him. What seems less relevant and timely in The Immortal is the focus on action, specifically car chases. All the intelligence of Gunn’s premise ultimately gives way to racing cars, as if a simple road chase can resolve all the difficult and fascinating philosophical issues of The Immortal. Sure, the climactic car chase is exciting, but not nearly as fascinating as the first half of this TV movie, which creates a feeling of paranoia, suspense, and helplessness as Richard realizes the deck is stacked against him. Individual freedom is an illusion, he recognizes, when the super rich can control society so easily, and without question. In terms of details, the car chase is not that plausible either, as the speeding cars go from a busy freeway in one shot, to rural dirt roads in the next. It's also hard to believe that muddy pond would stop pursuit of Richards, even temporarily. Finally, it’s intriguing to note that there is a scene, early in The Immortal, that predicts, almost exactly, a scene in the (great) Unbreakable (2000). Here, Pearce interviews Richards and asks him about his medical history, learning that he has never been sick a day in his life, and that he never suffered from any illness or disease, major or minor. In Unbreakable, Elijah (Samuel L. Jackson) has an eerily similar interview of David Dunn (Bruce Willis). When viewed in comparison to the literary Immortals, this 1969 TV-movie is a big come-down, one might conclude, forsaking a setting that would have made it even more relevant in the 21st century. On the other hand, this TV movie is very well-made and acted, and is superior to The Fugitive-style episodes to come. I'm excited that you've chosen "The Immortal" to be the series you're going to examine next. My Father used to tell me about this show, yet I never saw it because it was scarcely, if ever, re-run. About two and a half years ago, VEI announced they were releasing "The Immortal" on dvd, and then...nothing. Recently on Youtube, a trailer for the series popped up in my feed, and I clicked on it. VEI had finally released it! I ordered it directly through them via Amazon, and the complete series arrived shortly before Christmas. At last I can see what my Dad was talking about. My comments here are delayed, because I wanted to watch the first episode before reading your review. I agree that the series is stylish and colorful, with high production values and excellent performances. Yet it feels very much of its time, and that included the fist fights and car chases. One thing that somewhat bothered me was the old adage, "show, don't tell." We're told all about Richards, his immunity, his potential immortality, but we never actually see him threatened with death. I think a greater sense of his predicament would have been enormously heightened if we actually saw him get shot, and actually recover from death. Perhaps that was too much for audiences at the time? Yet, we see two people on death's door who are saved by his blood in the same telefilm. Also, his carefree attitude while being "on the run" and hanging out with Sylvia make his decision at the episode's end seem kind of flimsy. Still, it was entertaining, and I'll be watching weekly along with you. I'm happy that I can finally see this show that my Father told me about, and that is something worth celebrating!